Gates of Vienna: Found It: The Islamic Golden Age! The following book review by Henrik Ræder Clausen was originally posted at Europe News, and is republished here with the author’s permission. 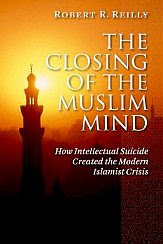 Book essay: The Closing of the Muslim Mind, by Robert R. Reilly. This book is about one of the greatest intellectual dramas in human history. Its landscape is the Muslim mind. How man regards his powers of reason has been a decisive influence on the shape and destiny of civilizations, including the Islamic one. How could it be otherwise, when these rational powers affect how reality is perceived, how revelation is perceived, what can be known, and how to discern the meaning of the known? There was a time when Islam embraced Reason and Logic, respected dialogue and challenged Christianity in open debate, a time when Islamic philosophers and leaders did not act from fear of intellectual inferiority. That time was primarily from AD 813 through AD 833, under the rule of Caliph al-Mu’man, and to a lesser extent under the reign of the next two Caliphs, altogether 34 years until AD 847. For the intellectual, this period in Islamic history can indeed be considered ‘Golden’. Robert R. Reilly, in his book “The Closing of the Muslim Mind”, sets out on an intellectual journey to identify this period, its influence on mainstream Islamic thought (Sunni Islam, to be exact — Shia Islam is different), how this intellectual freedom declined step by step. And in particular how it was ultimately killed off entirely by the Sufi imam Al-Ghazali, crushing the resistance of Ibn Rushd (Averroes), who was eventually declared a heretic. His books were burned in public and he himself was exiled. In slightly over 200 pages, Reilly dives into the works of Islamic philosophers and the ideological battles that raged up to 1200 years ago, over the nature of Allah, free will vs. predestination, and the eventual defeat of rationalism in the struggle against strict Islamic law, Sharia. A short period of Hellenic influence can be found in the 9th century, followed by an extended period of decline, where over centuries the proponents of free will and rationality were exiled from the heart of Islam. This book is a stratospheric intellectual journey, for good and for bad. It is not for those intimidated by long philosophical debates, for it does challenge the reader significantly. But for those up to the challenge, the book is highly rewarding, as it enables the reader to identify crucial details in the Islamist narrative, makes it possible to identify subtle sleights of hand, and thus to effectively counter it. A peculiar feature of the book is that through focusing solely on the relatively narrow field of Islamic philosophy, the historical context of Islamic conquest, Jihad and the political system of Islam are largely not touched upon. This gives Reilly the freedom to address philosophical points on their own merits, but to get the full benefit of the book, it is very useful to have a solid historical background about how Islam developed and spread. Along the way, Reilly explains in clear terms the problem of voluntarism, in which according to Islamic theology every single happening in life, every stone dropping and every fire lighted, is but the direct expression of Allah’s’ will, and the catastrophic implications this has for the loss (in principle) of cause and effect in Islamic thinking. A reader of Christian background might well find this weird, but it is well worth it to be aware of these fundamental philosophical differences between Islam and other religions. Eventually, Reilly does not restrict himself to philosophical deliberations. Towards the end of his book, he moves on to show how these philosophical principles, strange as they might sound, empower the fundamentalists and the radicals of Islam — the very people we make so great an effort to defeat. The book is short, which is probably a good thing. It makes demands on the reader, but pays back well when proper time and deliberation are invested in it. For anyone desiring an insight in how Islamic tenets developed, and how they influence our world today, there is really nothing comparable. Purely historical accounts of Islam abound, philosophical explanations are rare. This is a very valuable contribution, but requires quite a bit of background knowledge to be fully appreciated. Opinion over and done with, let us have a closer look at what this book is about. What is the “Islamic Golden Age”? The Islamic Golden Age is traditionally dated from the mid-8th to the mid-13th century A.D. (sack of Baghdad by Hulagu, the grand-son of Genghis-Khan). This is simplistic, however, for it defines it simply as the period of the first Abbasid Caliphate, which evades defining what exactly would make the age ‘golden’. The Wikipedia article on the Abbasid Caliphate provides a more honest overview of the rise and decline of the period, showing that it was not exactly golden. The Islamic Golden Age was of enormous importance to the development of world knowledge and technology. It came in a time when Islam and the People of the Book living under the nation of Islam were politically united and lived in harmony. As usually said, our unity has always lead to our strength and on the other hand fitna is the source of our weakness. The golden age of Islam brought about wonders to the world whether scientific, educational, architectural, medical and or any other subject one can think of. In Islam, it is encouraged to try and achieve the highest knowledge, in an Islamic civilization. The Muslims of the caliphate were reminded about this everyday. When people did try to achieve knowledge, they inspired many others to do so whether Muslim or not, as a result of this when the Caliphate and other Islamic states did exist; advances in technological, medical, social, judicial, scientific, political and many other areas were made everyday. It’s easy to ridicule such exaggerations, for example by pointing out that European inventions of the same period (not to mention later) are much too numerous to mention, that the inventions in the Islamic world were frequently done by non-Muslims, in spite of Islam, and to no benefit for the citizens of the Islamic countries at large. Or, to look it in another way, that since this intellectual creativity died out at least 750 years ago, the Islamic world must have been ruled by idiot, pirate slave-traders ever since — that it should get its act together and get more sensible rulers. Besides being partially conquered multiple times Europe was economically revived thanks to the Muslim Golden Age, Europe would’ve been left behind in Medieval times if it were not for the Muslims. The other seed of truth, so obscure that the author of Muslim.eu would probably not be aware of it, is that when Toledo was conquered from the Moors in 1159, Europe gained access to Greek classics that had been translated into Arabic and kept safe in the library. Safe from influencing Islamic thinking and public philosophy, that is. When these works were translated into Latin, the influence on Christian philosophy was extensive, leading to a revival of philosophy, a clearer understanding of rationality, reason and logic, the first formulations of universal human rights, economical and technical progress, and a voluntary abandonment of slavery. Thus, the Islamic world did indeed bring seeds of progress to Europe. In contrast to the Islamic world, the seeds found fertile soil, sprouted, grew and bore fruit. But the fact that the classical Greek texts survived in the Islamic world can hardly be credited to Islam itself. This happened in spite of Islam. The belief that Islam revived Europe economically (our technological and accounting advances did that). The idea that Muslims brought Europe out of the Middle Ages (the Middle Ages were fine in themselves). The discreet notion that Europe ‘owes’ something to Islam. If anything, the only credit we owe Islam is for motivating our valiant self-defence. There is nothing owed, and nothing that makes Islam deserve any form of repayment. And, not least, there is the implicit attempt to establish Islam as morally equivalent (at least) to Christianity. The call to Jihad is nothing but the call to expend the effort to restore Islamic Faith, the Caliphate, and make the reign of Islam as extensive as possible. This is a battle cry we’d better heed. It is, in part, based on a misreading of history. Islam’s “golden age” was parasitic on the Christian cultures and peoples it conquered, and ended when it “killed the host”. “A people that deprives itself of philosophy necessarily exposes itself to starvation in terms of fresh ideas — in fact, it commits intellectual suicide”, — Fazlur Rahman, Islamic scholar. While Pope Benedict XVI may be justified in pointing out that we in the West are slowly losing our Hellenic heritage of Reason, it is widely assumed that Islam has always been contrary to reason. This, surprisingly, is not the case. It just happens that Islam was dehellenized so early and so profoundly that even suggesting the idea that things have been different now constitutes heresy. The role of reason is pivotal here. It has immense implications to know, for instance, if reason has any standing to address revelation, judging it against certain standards, or if revelation is above reason. Since Muhammad was in no way a theologian, it was left for later generations to develop a theology from the Quran and other Islamic traditions. Particularly after the extensive Islamic conquests in the 7th and 8th centuries, the need to develop a consistent notion of the divine became clear, as other religions bordering the Islamic world had long since wrestled with these problems and found well formulated answers to them. Islam needed to catch up, or have its credibility as a religion undermined. The Mu’tazilites were first in doing so, establishing their ideas of divine nature, rationality and morality during the 9th century. Their opponents, the Ash’arites, formed later. The Mu’tazilites, who advocated divine reason, justice and morality. The Ash’arites, who advocate divine omnipotence, not bound by morality or reason. The Hanbalites, who would have none of this, and stuck to the scriptural commandments. As the Hanbalites did not even engage in logical debates, the main battle was between the Hellenic-oriented Mu’tazilites, advocating that Allah is reasonable, moral and just, and the fundamentalist Ash’arites, who logically would argue that any commitment to reason or morality would constitute a violation of Allah’s omnipotence and thus be essentially impossible. This battle of reason and morality versus the supremacy of the Will has taken place at other times and places. Most famously in 19th and 20th century Europe, where the German philosopher Friedrich Nietzsche and his advocacy of the supremacy of the Will were rudely exploited by rulers considering themselves unbound by any form of absolute morality, leading to an absolute disaster. A similar struggle is currently taking place between Islamic fundamentalists and moderates, the former unfortunately dominating. From the point of view of a ruling elite, reason and morality are dangerous tools. If they can be held accountable by either, their violations of either can lead to embarrassing situations, which could jeopardize their legitimacy, their claim to be just rulers, and the whole system of absolute rule that has been Islamic tradition through 13 centuries. As the Mu’tazilite position would grant significant power to the common man, the Ash’arite position would usually be preferable to rulers. This position dominates Sunni Islam today, and constitutes a significant obstacle to establishing accountable democracies in Islamic countries. The decree by Muhammad that whatever the Umma decides is flawless, compounds the problem. Therefore bring forward all the arguments you wish and say whatever you please and speak your mind freely. Now that you are safe and free to say what ever you please, appoint some arbitrator who will impartially judge between us and lean only towards the truth and be free from the empery of passion, and that arbitrator shall be reason, whereby God makes us responsible for our own rewards and punishments. Hereby I have dealt justly with you and have given you full security and am ready to accept whatever decision reason may give for me or against me. Opposition to the idea of Islam being a rational religion, in which Allah is bound by logic and morality, formed relatively quickly. Al-Ash’ari was the leading opponent, giving rise to the Asharite school of thought, which by means of reason seeks to demonstrate that reason is not compatible with Islam, that reason cannot be used to know the divine, and thus there is no compelling reason to apply reason to the Quran or other things Islamic. This was a more sophisticated position than the Hanbalite, and with a solid footing in Islamic scripture was effective in pushing back Mu’tazilite dominance. In the year AD 848, the tables were turned. Caliph Ja’afar al-Mutawakkil declared the Mu’tazilite position heretical, punishable by death, and books as well as persons advocating this position were cleansed from the Caliphate, including whipping of the Muslim philosopher Al-Kindi (not the same as above). In 885, the copying of any book on philosophy was banned, and in 892 a ban on trading books on philosophy, theology and related subjects was enforced. The Mu’tazilite position was forced underground. This led to a cascading collapse of reason within Islam. From the demotion of reason followed the primacy of the will, Allah as unknowable, the loss of causality, epistemology, objective morality, justice and free will. In short, most of the qualities with which Hellenic thinking has endowed Christianity. Much too detailed to repeat here, Reilly goes through how each of these components fell by the wayside, once the fundamental issue of reasons’ applicability to the divine had been resolved. The end result being that practically nothing but jurisprudence, in other words the application of Sharia law, remains a vital and living issue in Islam. Probably the most intriguing chapter in the book is the one about the supremacy of the Will. This is a sensitive subject here in Europe, for we know from the disasters of the 20th century how an immoral application of the supremacy of the Will can lead to immense disasters. But the subject is important, not least because large numbers of Islamists today consider themselves subject to the Will of Allah and show extreme determination in applying Allah’s Will in the real world, usually to the detriment of those who do not believe in Allah or the Quran. Even a speeding arrow may or may not reach its destination, they said, because at each moment along its path God destroys the world and then creates it afresh the next moment. Where the arrow will be at the next moment, given that it was at a particular spot at an earlier moment, cannot be predicted because it is God alone who knows how the world is to be recreated. By European Medieval standards, this is really far-fetched. With the advent of modern astrophysics and high precision clocks, this has moved from grossly implausible to obviously absurd. The known universe is roughly 13 billion light years across (to compare, the Solar System is 8 light hours), and if the entire universe was to be destroyed and recreated a billion times a second, Allah would be quite busy tearing things apart and putting them back in the same place they were a billionth of a second earlier. This just doesn’t add up. A different fundamentally unscientific nature of this claim is that no way exists to disprove it. From a Western point of view, this is too hopelessly absurd to deserve consideration. Worth noting in context is also the degradation of rationality, in the Western world (and East Asia) considered fine qualities: By descending into absolute voluntarism, rationality becomes benign and meaningless. From a mainstream Islamic point of view, this world view is a necessity, for no natural law can be permitted to restrict the Will of Allah. Things are different from a Christian point of view, of course, for here the laws of nature are part of Creation, and exist in order that man can examine them and make the most of them. The root causes of the fatalistic Islamic world view is here. Christianity really is fundamentally different, much to the benefit of all who enjoy the products of science and technology. The loss of rationality has an obvious consequence: the rise of irrationality. From the ‘impure’ nature of pigs, dogs and infidels to the spread of absurd literature, such as Mein Kampf and The Protocols of the Elders of Zion, the Islamic world has little basis for evaluating what is rational and what people have been forced to believe, nor even tell the difference between the two ways of thinking. The chaotic worldview is a bad breeding ground for absolute morality, like a solid concept of private property or the sanctity of life as such, and provides no philosophical basis for contradicting terrorists such as PLO, Hamas or Hezbollah, who act in the name of Islam and Allah. This is what the final parts of Reilly’s book deals with, and is important for policies today. We cannot assume that our opponents act in way we would consider rational, including the vital point of respecting treaties and other mutual agreements. We need to use our own critical faculties in this case. Back to history, where one important figure deserves mention, to say the least. For even though the Mu’tazilite world view had been pushed from the throne, it still existed in the Islamic world for centuries. To not only discredit the idea that Islam can be compatible with reason, but to kill it and bury it deep, a very special person was needed. That special person was one of the greatest nihilists the world has ever fostered, the Sufi master and philosopher al-Ghazali (AD 1058-1111). It is said that al-Ghazali then had Muhammad instruct him through his dreams to drive reason out of Islam, to which he complied by a direct assault on anything related to reason. Muhammad then showed himself another time, instructing al-Ghazali to not merely abandon reason, but instead use reason as the very tool to evict reason from Islam. His magnum opus, The Incoherence of the Philosophers (ca. 1090), (PDF here), should be seen in this light. Al-Ghazali’s rejection of reason and assertion of voluntarism swept the Islamic world and became mainstream Sunni orthodoxy. In twenty chapters, it analyses and disparages any form of philosophical approach to knowing the divine, and effectively shuts the door to reason as being valuable or a worthy pursuit for pious Muslims. The door remains shut, to the detriment of abstract debate of reforming Islam. In fact, the only issue truly left open to debate amongst Islamic scholars is the particulars of implementing Islamic law, Sharia. Thus, al-Ghazali significantly strengthened the fundamentalist reading of Islam and created a foundation that later the Muslim Brotherhood and its ideologists Hassan al-Banna and Sayyid Qutb would build upon, in turn providing intellectual justification for today’s’ Islamic terrorists. It deserves mention that a countercharge on The Incoherence was launched. In The Incoherence of the Incoherence, Islamic philosopher Ibn Rushd (1126-1198) (also known as Averroes) defended the Aristotelian tradition against the voluntaristic and irrational analysis of al-Ghazali. But this was too little, too late. Averroes lived to see his books burned in Cordoba and himself forced into exile. The Muslim mind had been effectively shut, and the Islamic world stood fast in face of any challenges. Thus also Islamic apologists who refer to Averroes as an example of profound Islamic philosophy really should know better. His books having been burned and himself exiled, he hardly constitutes any meaningful evidence of the acceptance of profound philosophy and rational thinking. Quite the contrary, he is a dire example of the consequences of such free thinking in the Islamic world. Can the Islamic mind be reopened? Or put in another way: “Can we enter the modern world and still retain our faith?” This is a tough question, and fundamentalists — who are clearly the most powerful today — are clear in their rejection of the idea. Probably the only way for this to happen is that Islam enter a profound existential crisis and rediscovers the forgotten seeds of Aristotelian thinking of the Mu’tazilites. This would require the West to solidly reject any kind of fundamentalist Islam that might take root in modern societies, isolating Islam to deal with the existential crisis at home. This does not seem likely at present, but a better understanding of the profound differences between Islamic and Western lines of thinking would contribute to making it happen. Get this book! Read it! It traces Islamic thinking in ways hardly offered anywhere else, and does so without the feeling of prejudice that other critical books of Islam carry. Then take the knowledge into the world and make the case for Islam to return to rationality. If it does, that would seriously undermine the justification for Islamic terrorism. If not, the same would happen. For then Islam would be seen increasingly as hopelessly antiquated, not a salvation for Muslims, but rather a yoke to be discarded. "The closing of the mind" and "How intellectual suicide created the modern crisis" aptly describe what's going on in the West right now. Most interesting article I have read in years. On reading this the impression came into my mind on several occasions that modern UK politics are islamic in nature. The ruling elites trick to subdue the British people economically, making the majority nothing more than helots their lives so wretched that the demand for order and relief is served up to them as submission to islam by the ruling elite - a very British Caliphate. "The closing effect of marxism on the liberal/progressive minds...."
"much was beginning to be done, mainly through the Catholic Church. Agriculture was progressing because of monasteries which had acquired large amounts of land and needed to use it more efficiently"
Yes, but the church never had freemen, instead, they used serfs, and more than that, SLAVES, to till the land. The church used the same system as the Ancient Romans, the "Latifundias." Not only did they they they own slaves, but they had an extensive business, in the slave trade. They also continued the system into the New World, with the "Repartamientos." From Paraguay to Florida, the Caribbean, and the Amer. Southwest and California. Whole tribes of indians were brought in forceably by the Spanish soldiers, forcesably converted, and put to work for life.
." The idea that Europe was economically revived due to the “Muslim Golden Age” is unsubstantiated and false, Europe created its own prosperity, and the Middle Ages were, when examined properly, anything but dark:"
This is from the overview of several centuries after, but the question of islam asiade, YES, the Middle Ages, were DARK indeed. If witnesses could be revived from that time, they would talk about the oppression of the Nobility, the constant fear, lack of food, and sanitation and hygiene, the punishments for transgressions, the grawings and hangings and quarterings for any rebellions or the cutting off of hands or hot pokers in the eyes, for daring to hunt deer, the constant backbreaking work, constant childbirths through which women were made to "pay for the sins of Eve"- the fear and terrors encouraged by the church of hell and "things that go bump in the night.' - dark nights indeed, DARK AGES.- through which our "peasant" ancestors lived.
" This would require the West to solidly reject any kind of fundamentalist Islam that might take root in modern societies, isolating Islam to deal with the existential crisis at home. " There are observances, I have to mention when "the West" is mentioned. it's being discovered that the "West" means 2 things. We are seeing that the will of the People is completely different that the will of the leaders of governments. As in Germany, where Merkel imposes hereelf saying "get used to it"- and the grassroots, who have awakened there, REJECT the will of the government. The same in the U.K., et.al. The same thing is happening in the U.S.
And We, The People, see that the governments are NOT working for us. Unfortunately, there are other tremendous problems besides islam. In Europe, there is the failure of the EU /Euro. - the Colombian Drug Cartel at which has even come into Ariz.
-the Massive Bail-0uts to Corps. -the lack of the full military and Nat'l Guard for protection - whether or not you agree with the wars, still, the protection is not there. - the US$ failing- since we no logner have exports to match our imports - leading to failure of the economy- as well, as the U.S. owing Trillions to Red China. -the Devil's Agreement the U.S. made with Red China (St.Peter don't you call me 'cause I can't go, I owe my Soul to the company store.). "While Pope Benedict XVI may be justified in pointing out that we in the West are slowly losing our Hellenic heritage of Reason"
Benedict, the vatican, the church never ever encouraged any adherence to Reason, but to FAITH. Reason is for science and philosophy. We weren't supposed to reason or question, but to accept the word of the church. FAITH. I've gone over this a thousand times with my family. The rulers /Nobiliity/monarch /church were doing this explitation, millennia before, WAAAY before Nietzche even came into the scene. "second, Allah would be quite busy tearing things apart and putting them back in the same place they were a billionth of a second earlier. This just doesn’t add up. A different fundamentally unscientific nature of this claim is that no way exists to disprove it. From a Western point of view, this is too hopelessly absurd to deserve consideration." Although, I hate islam with a passion, science, Quantum Physics, Particle Physics, has proved this to be true. In Imperical lab experiments, done by PhD, particles have arrived at a target, BEFORE, they were even sent out. It doesn;'t make sense, it's weird, Nobody understands it, but there you have it. This experiment was done over and over again, but different physicists at different locations. "When these works were translated into Latin, the influence on Christian philosophy was extensive, leading to a revival of philosophy, a clearer understanding of rationality, reason and logic, the first formulations of universal human rights, economical and technical progress, and a voluntary abandonment of slavery." Yeah, a "voluntary abandonment of slavery"- after hundreds and hundreds of yerars, during which the serfs and slaves had uprising,s and were put down viciously. "Why would a God that is Omnipotent, need a Human to help it's cause?" "Why would it need a Human to worship it?" Re: the middle ages, you don't know what you are talking about. What you have got hold of there is old stereotypes. Recent archaeological research has shown that people ate better in the middle ages than in the 1500-1800 period. The reason is probably more favorable climate. The enslavement of the peasantry was not fully realized until the 17. century. Life was simply better in the middle ages than in the modern pre-enlightenment period. Serfs and slaves are different from one another. A serf is bound to the land, and works on contract. Over time, the contracts were replaced with payment of rent. The slave is a human being who is owned-- property. Muslims still own chattel slaves. Western society abandoned slavery a long time ago. 620,000 Americans died to end slavery. Not one Muslim ever died to free slaves held by his brethren. You have nothing to tell us about morality, perfection, spirituality or revelation. We owe you nothing that is ours. Slavery was abandoned, not serfdom. Abandoning the latter hardly made sense, for the level of education nor technology was not sufficiently advanced for large number of free people to take up employment in a free market. The system of serfdom provided a level of mutual security that suited many people well. Only in the 18th century were we ready to fully abandon this as well. It was a system for its time. "Even a speeding arrow may or may not reach its destination, they said, because at each moment along its path God destroys the world and then creates it afresh the next moment. Where the arrow will be at the next moment, given that it was at a particular spot at an earlier moment, cannot be predicted because it is God alone who knows how the world is to be recreated." The following link affords an explanation of the above statement. (that are to be found in the following link of an interesting review related to the above topic). My last link in post 12 doesn't work. Hopefully, at least one of these might.